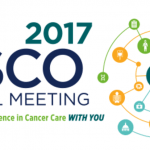 This weekend members of the American Society of Clinical Oncology (ASCO) will hold their annual meeting in Chicago. It’s one of the largest scientific conferences in the world, with thousands of studies being presented on new ways to prevent, detect and treat cancer. But those presentations are often very limited in the time provided and the substance delivered. To drum up publicity beforehand, the ASCO public relations team sends out batches of news releases about “high-impact” research results that are embargoed until the conference happens. This means that journalists are forbidden to publish stories about the research until the embargo lifts. 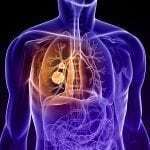 These news releases–and the embargo process–undoubtedly shape what the general public will find out about new cancer research, as we discussed in our overview piece “ASCO 2018: How a major medical meeting uses embargoes to shape the news, and what the consequences may be.” In some cases, as we also pointed out, the information that reaches the public about this research will be incomplete and imbalanced. This process will kick into high gear over the next few days, as oncologists descend on Chicago and the journalists rush to break news before their competitors. 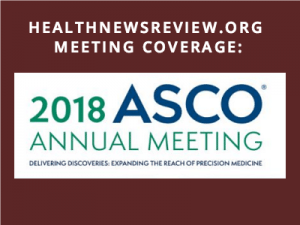 Today, the first day of the meeting, ASCO’s media team is featuring studies involving disparities–how geographic, racial and gender differences affect quality of care. We applaud ASCO for focusing on research that may not necessarily generate “breakthrough” headlines, but which undoubtedly impacts patient care. I'm seeing many tweets from MD colleagues about abstracts at upcoming @ASCO Annual Mtg #ASCO18 that suggest results represent new std of care. Respectfully suggest we all temper ourselves & await full presentations, discussions, & peer-reviewed pubs. Prowell, a breast cancer specialist, is right to advise caution. 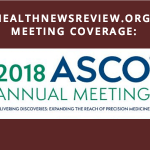 Only top-line summaries of research–known as abstracts–will be presented at ASCO18. Without seeing the full study, important things are impossible to ascertain, like the rate of adverse events. That lack of information is good for drug and device companies hoping for positive social media chatter and press coverage, but bad for people who want to know the real harms and benefits. And since the full findings have not been peer-reviewed or published, they should be considered preliminary. Some studies presented at ASCO18 may never get peer-reviewed or published, and if they do, they may look very different than the abstracts. A new report shows that every new cancer drug that debuted in 2017 cost more than $100,000. For that price, one might expect that these drugs would guarantee many cancer-free years of additional life, but they rarely do. That’s why Mayo Clinic blood cancer specialist Vincent Rajkumar, MD, asked for examples of expensive drugs with minimal benefit. He and other have taken to calling this #financialtoxicity. For those curious to know more, this paper is a great summary of the problem and how it extends beyond new immunotherapy drugs–such as using chemotherapy for patients at the end of life, or CT scans and certain blood tests for ovarian cancer. As we’ve learned after reviewing thousands of news stories about medical interventions, the cost of the treatment is rarely discussed. For cancer-related stories, we consider this a critical error. Most new drugs or research findings will only have a small impact on cancer patients’ lives. Yet that reality is often not reflected in news releases and news stories, leading to misleading information about cancer treatment.